Racing XC, or just ready to fly up single-track the Talus Carbon Frame provides the platform to get you there. Having the right geometry and using the right carbon in the right places makes the performance of this machine unparalleled. 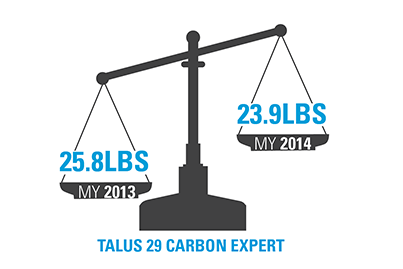 The Talus Carbon frame weighs in at only 1270 grams, it’s the lightest mountain bike frame we’ve ever made. Fabricated out of high modulus carbon fibers utilizing Direct Connect frame construction technology, it yields a responsive and fast on-trail ride. 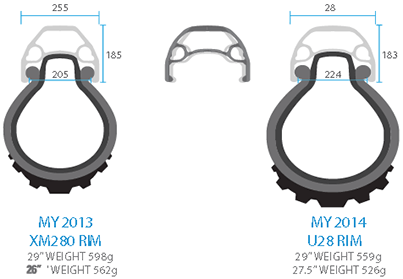 The tapered head tube and Shimano 142x12 thru axle rear end keep the bike stiff and in control. Maintenance can always be an issue off road, so we routed the cables internally to protect hydraulic lines and housings as well to help eliminate dirt and grime build-up—all maximizing cable life and minimizing headaches.